This Concord grape mousse is an excellent late-summer, early-fall dessert, capturing the full, rich flavor of ripe grapes in a light and fluffy mousse. And while it’s made with gelatin, I hesitate to call it jello, because when most of us hear the word jello, we remember bright green, jiggling molds filled with mandarin orange slices. This is definitely not that. 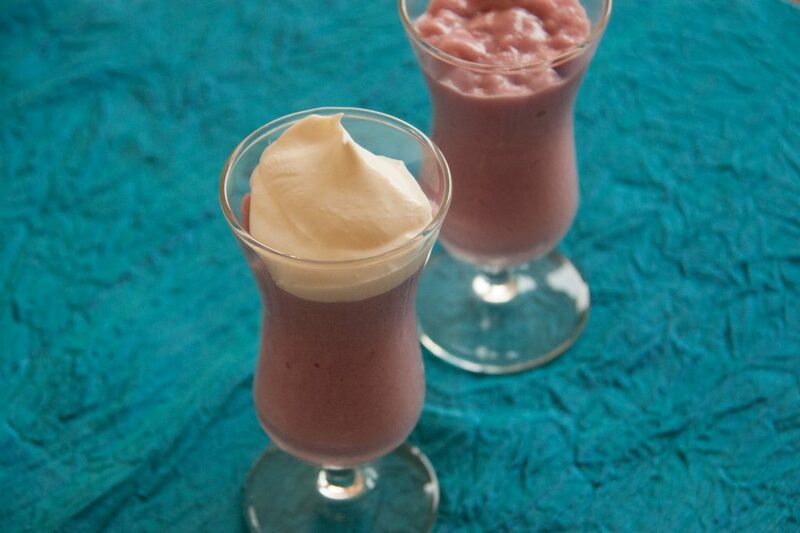 This is a creamy, fruity, sophisticated dessert for grape lovers of all ages. Concord grapes may be white or purple. (The white Concords are actually green, but I’m calling them white because I don’t want there to be any confusion about green grapes being unripe grapes. This recipe calls for ripe grapes.) Both colors of Concords are highly fragrant, taste similar, and are slip-skin grapes. That means it’s easy to pop the flesh right out of its skin with a gentle squeeze. (You don’t need to do that for this recipe, but it’s good to know.) If you use white Concords, your mousse will be a pale pink. Purple grapes yield a light purple mousse. My favorite way to juice grapes is with a steam juicer, but you can also do it in a sauté pan with just a little water. How much juice your grapes yield will depend on how juicy they are, but I usually find that 5 lbs. of Concord grapes yields about 1 quart of juice. Sprinkle the gelatin onto 1/4 cup of cold water and let it bloom for about five minutes. In a saucepan, combine the grape juice and 2/3 cup sugar, whisking to dissolve over medium heat. Add the salt and lemon juice and whisk to combine. Next, add the gelatin to the grape juice. Reduce the heat to low and whisk to dissolve the gelatin. Test a bit between your fingers to be sure all the granules have dissolved. Pour the mixture into a bowl, cover the bowl, and refrigerate until the juice has begun to jell. This will take two – three hours. In a separate bowl, whip the cream of your choice until it reaches the soft peak stage. If you’re using whipping cream, add the teaspoon of sugar. If you’re using coconut cream or another non-dairy whipped topping, you probably won’t need the extra sugar. Taste the cream and decide according to your taste. Add the grape mixture and egg whites to the whipped cream, and beat on high until the entire mixture is thick and evenly-colored. Transfer the Concord grape mousse into pretty dishes, cover them (so they don’t pick up any refrigerator smells) and refrigerate until you’re ready to serve. Then, top with additional whipped cream. Alternatively, you could pour the mixture into a cookie crust and serve this as a chilled pie. Before I had a stem juicer, I juiced my fruit in a sauté pan. If you’ve ever made jelly, it’s the same process: put the grapes in a shallow layer in a pan, barely cover them with water, simmer for about ten minutes, and mash to release the juices. Strain the juice through a jelly bag, and voila!